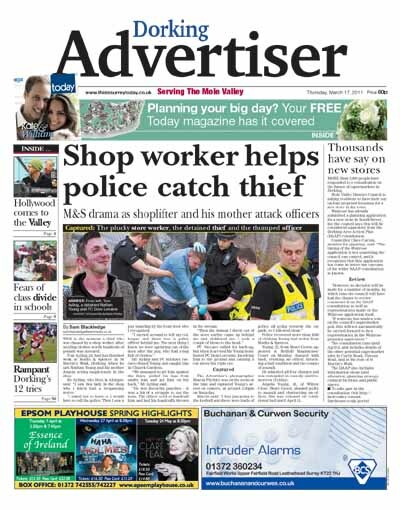 A weekly newspaper photographer secured a scoop on the arrest of a shoplifter who was chased by a brave shop worker – after he followed police who were dealing with the incident. Martin Pitchley was going to cover a football match for the Dorking Advertiser when he spotted police officers heading towards a car park and decided to follow them, rather than let a possible story pass him by. He managed to capture on camera the moment the shoplifter was arrested after stealing clothes worth hundreds of pounds. The story made the front page, pictured below, after he also got the phone number of Marks & Spencer shop worker Tom Ayling, who had followed and captured the thief with a police officer, so reporters could follow it up. Martin said: “I was just going to the football and there were loads of police all going towards the car park, so I followed them and it all went off. He also captured the assault of a police officer by the shoplifter as he tried to resist arrest. Following the incident, 25-year-old Nathan Young, from Beare Green, appeared at Redhill Magistrates’ Court charged with theft, resisting an officer, breaching a bail condition and two counts of assault, which he admitted. He was remanded in custody ahead of sentencing. His mother Angela Young, 42, who was also involved in the incident, admitted assault and obstructing an officer. She was released on conditional bail until 11 April. Crime of the century!! Any good journalist would follow a blue light, not exactly worthy of a story on HTFP. Tragic isn’t it? Another example of how these days the daily life of the average photographer and reporter is so mundane that they get excited by the arrest of shoplifter. Even worse is the judgement of their bosses who saw it as front page news. Well done to photographer Martin Pitchley for following his nose but for goodness sake the paper should have kept a sense of proportion over the end result. I can’t believe that a town the size of Dorking is that devoid of decent news. I agree this is hardly worth of an HTFP story but all credit to the photographer involved anyhow. What I find more alarming is that the front page image appears to be a montage and is confusing to the eye. Why not just use a single picture of the arrest? Full marks to Martin for being in the right place at the right time and for getting a good action shot of an arrest in progress. For a town the size of Dorking, surely it doesn’t warrant a front page lead? Sadly, shoplifting and thumping coppers are commonplace events. Unless it was a very quiet news week, it would have been better placed a fair way inside the paper. Treating stories in this way is only going to put off readers from buying local papers, not make them want to buy them. Two worrying points here. One, that holdthefrontpage think it’s so unusual it’s worth a story. Two, that the paper presumably were so gobsmacked that a staff member did what used to come instinctively to journalists that they thought it was worth crowing about. It would be interesting to see here a response from someone at the apparently “sleepy” Dorking Advertiser. What excuse have they for splashing such tosh on the front. As others have said, years ago a paper turning out stuff like this would have been ideal for ridicule on the rivals’ office noticeboard. There must be more interesting and meaty stories going on in Dorking. No wonder local paper circulations are dipping. Next week can we see reports of what the weather has been like in Dorking in the previous week, a pic of their High Street and someone putting their washing out to dry, or perhaps readers’ letters telling us how quickly they find their paint is drying on average? Trust HTFP comment section to be full of dismissive arrogance and snobbery. Honestly, some of you need to get a grip. For a start, HTFP isn’t making this out to the biggest story since someone took a sharp object to a loaf of bread. Instead it’s just a report on a good piece of news houndary by a photographer. Amid all the stories of redundancies, closures and phone hacking it’s quite heartwarming that the success stories, no matter how small, are still given coverage. Dorking Ad’s splash might not be the most hard hitting crime story, but certainly ticks other boxes and is a perfectly valid choice for a front page. Even if you disagree, most of the cynicism and snide comments are uncalled for and smack of arrogance. More importantly, I happen to have worked with Martin with another paper for a number of years. If there is hard working snapper with a keener eye for a story in the country I would be very surprised.